It has been said that the longer two people stay together as a couple, the more they look alike. Recent studies have also found that when people select a pet such as a dog, they often consciously or unconsciously pick one whose appearance resembles their own. But the following true stories from the animal kingdom illustrate a different kind of affinity, one that goes beyond outer appearances. 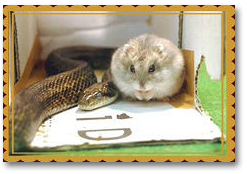 [Tokyo, Japan] When Aochan, a two-year-old rat snake who lives at the Mutsugoro Okoku Zoo in Tokyo, began refusing to eat his usual fare of frozen mice, his zookeeper introduced Gohan, a dwarf hamster, into his cage. The intention was to offer a tasty snack that imitated what Aochan would find in the wild. But Aochan showed absolutely no interest in Gohan as a meal, and instead his keepers were shocked to see a friendship developing between these two unlikely partners. Four months after being introduced to each other, Aochan and Gohan continue to share a cage in the Tokyo zoo. Not only do they get along, they now show signs of affection. Zookeeper Kazuya Yamamoto reports, “I’ve never seen anything like it. Gohan sometimes even climbs onto Aochan to take a nap on his back.” Thus, through their improbable friendship arising from the power of love, this three-and-a-half inch rodent and yard-long serpent have definitely extended the zoo’s already strong reputation for allowing different species to interact with each other! Puppy and ‘big cat’ Koza play together. 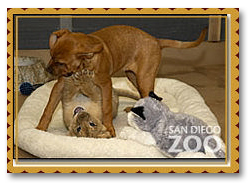 [San Diego, CA, USA] On February 1, 2006, CBS News reported that a puppy named Cairo, whose mother was rescued from Hurricane Katrina, had been selected by the world-famous San Diego Zoo to provide companionship for a young lion cub named Koza (meaning ‘Bright’ in Swahili). Little Koza had been left on his own since his mother lost another cub while giving birth and had to have a C-section performed to rescue him. The construction worker soon realized that the cat and dog had become bonded companions, and unable to keep them himself, he took them to a shelter sponsored by the animal protection group Best Friends. After they were dropped off at the shelter the staff discovered that the cat was blind so the gentle female dog was both his protector and friend. 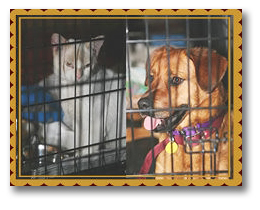 Their mutually short tails inspired the shelter staff to call the cat Bobby and the dog Bobbi. And even though this was the first time the shelter had boarded different species together, they knew that these two belonged with each other. So Bobby the cat was placed in a smaller-sized cage that fits inside Bobbi’s larger kennel. 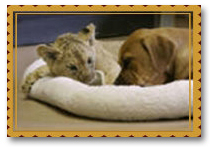 Best Friends has also vowed not to separate the two and will only allow them to be adopted together. The above-mentioned stories reveal that no matter where we travel today, the power of love is growing stronger, beyond all limits of the imagination, joining even the most unlikely beings in friendship. After all, if a snake can love a rodent, anything is possible! As Master has said, “Actually, if we can love a dog, why not love a cow or a pig, because they’re the same! This is one reason we should be vegetarian: to extend our love to all beings, to enlarge our love, to enlarge ourselves to the whole universe.” (Spoken by Supreme Master Ching Hai, Videotape #399, December 4, 1993, Portland, Oregon).